Selecting the right cell phone signal booster for your home can be very confusing. (It’s difficult enough trying to decide if one will even work in your home!) Here’s the information you need to make the right decision. Do I need a home cell phone signal booster? What will a home cell phone booster do for me? Will a cell phone signal booster work in my home? Should I buy a 4G or a 3G signal booster system? What kinds of home cell signal boosters are available for home use? The most common reason is to improve voice and data connectivity in homes that suffer from dropped or missed calls and poor data performance. 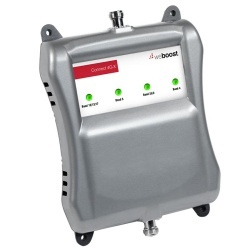 Cell signal boosters can target specific carrier towers using directional antennas. This allows you to choose a specific cell tower that may have a lower user load, thus providing better voice and data performance. Sometimes you’ll get acceptable signal in your home because your carrier has a cell tower located nearby, but you want to accommodate friends and family members who use a different carrier that doesn’t have the same level of signal quality in your home. A strong cell signal will reduce your cell phone’s battery consumption. Cell phones use more power when operating with weaker tower signals. Improve cellular reception throughout your home or in specific problem areas. Improve your voice signal, helping to eliminate dropped calls and missed text messages. Improve 4G data transfer rates for faster email, web browsing, and other apps. Reduce your phone’s battery consumption. Coax cables that connect the antennas to the cell signal booster. The cell signal booster (also known as an amplifier) is the heart of the system. It’s a bidirectional (two-way) amplifier that receives, amplifies, and broadcasts signals to and from the cell tower and to and from your cell phone or other cellular device. A single room, office, or small work area (1 room). An apartment or small house (2–3 rooms). A large house (2,000–3,000 square feet). As boosters increase in coverage, they go up in price: The more power and range you need, the more robust the equipment you’ll need and higher the price you’ll pay for that equipment. Smaller amplifiers have plastic cases; larger, more powerful boosters have metal cases. Most cellular amplifier have two ports: one for the exterior (outside) antenna and another for the interior (inside) antenna. The amplifier comes with a power supply that you’ll plug into a standard 110-volt wall socket. The amplifier is the only component in the booster system that requires electrical power. Cellular amplifiers have LED lights or an LCD display on the front that indicate how the amplifier is performing and if there are any errors that need to be addressed. 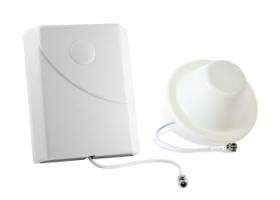 Cell signal boosters for small and large homes come with an outdoor antenna (also called a donor antenna) that communicates with the cell tower. The donor antenna is directly connected to the outside port on the cell phone signal booster via a length of coax cable. A directional antenna (either a panel or LPDA) is pointed toward a specific cell tower. Directional antennas are useful if you want to boost the signal from a single carrier, or if the towers for all major carriers are off in the same direction. They are also used when towers you don’t want to use are so close to your location that they’re overpowering your cell signal amplifier. Directional antennas work best when you have a good line-of-sight to the cell tower, without hills, trees, buildings, and other obstacles in your path. 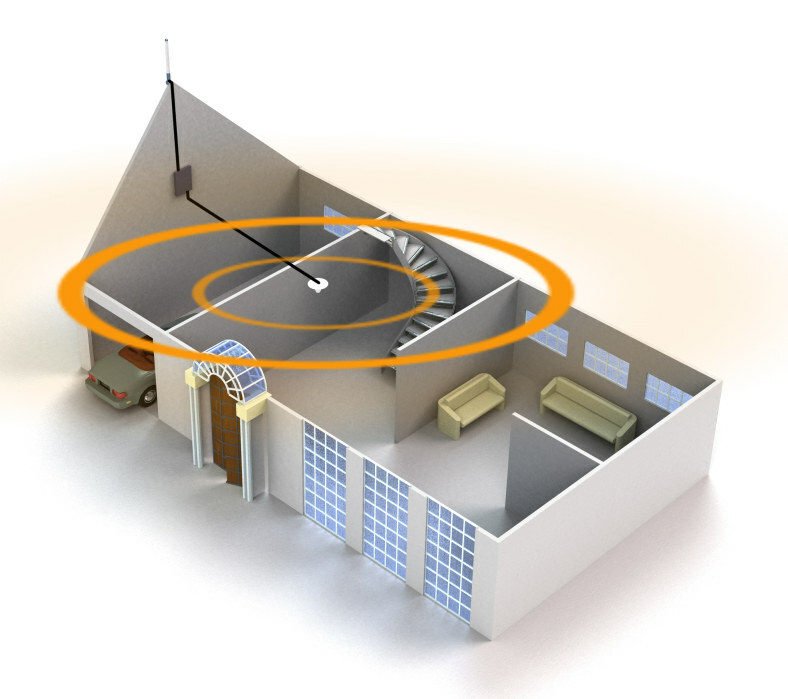 An omnidirectional antenna collects and broadcasts cell signals in a 360-degree circle, communicating with any cell tower available in any direction. Omni donor antennas work best when you have perfectly fine outside cell signal, but that signal can’t adequately penetrate inside your building. They also work well when you want to amplify signal from all major cellular carriers, regardless of the specific direction their individual cell towers are from your home. The indoor antenna (also called a broadcast antenna) communicates with cell phones and other cellular devices inside your home. The broadcast distance of an interior antenna is the result of multiple factors, including the power output of the booster, the strength of the outside cell signal, the length of the cables between the booster and the antennas, and the type of cable your system uses. There are two types of interior antennas. The design or layout of your home usually determines which type of antenna will give you the best coverage. A directional panel antenna broadcasts in a focused beam, like a flashlight; you aim this antenna in the direction where you want improved signal strength. Panel antennas are usually mounted on vertical surfaces, like walls or windows; they can also be mounted above or below drywall or drop ceilings, and hidden in recessed wall panels. A dome antenna broadcasts in downward circle, with 360 degrees of signal coverage below it in a shape similar to a donut. Domes are usually mounted on ceilings in the middle of the area that requires enhanced cellular coverage. Dome antennas may be mounted above or below drywall or drop ceilings (ceiling materials will typically not inhibit cell signals). Dome antennas are popular and practical, are used in most commercial buildings, and work well in residential applications. A cell signal booster system uses coaxial (“coax”) cables to connect the exterior and interior antennas to the cell signal booster. RG174 coax cable is the thinnest cable (less than &frac18; inch in diameter). It is very light and flexible, and easy to conceal. RG174 is used in many vehicle cell signal booster kits because it can be run in tight locations and hidden behind plastic molding. Because it’s so thin, RG174 has very high signal loss per foot of cable.The Wilson 301211 desktop antenna (used in the weBoost Home single-room booster system) uses RG174. 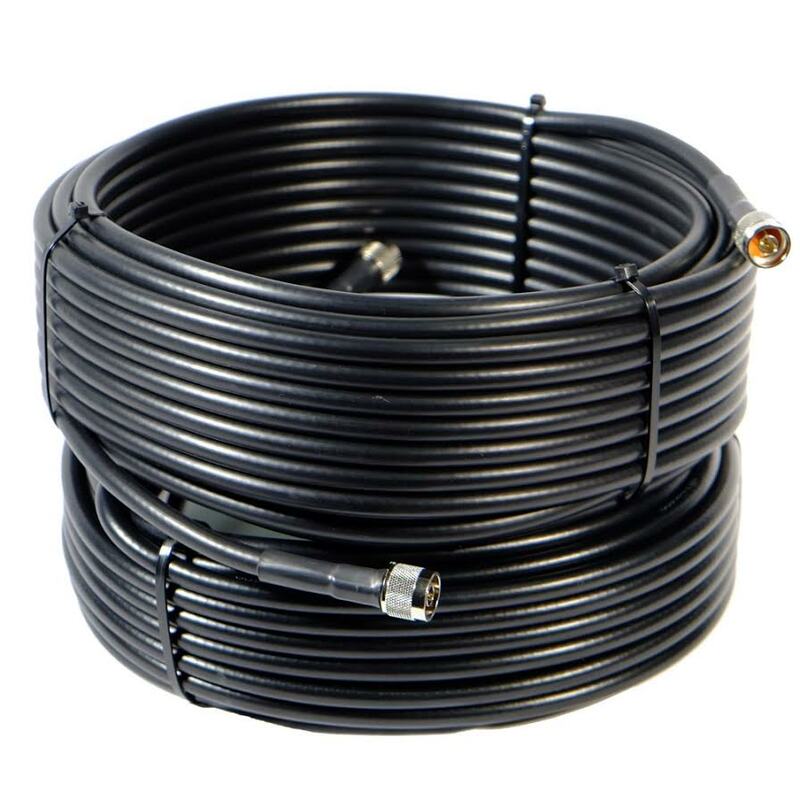 RG6 coax cable is very popular in residential applications. You’re probably already familiar with it because it’s the same type of coax cable used to connect cable and satellite boxes to TV sets. It’s just over ¼ inch in diameter. RG6 has about one-third the signal loss per foot, when compared to RG174. It can be used for short runs in cellular amplifier systems, typically no longer than 30 feet. 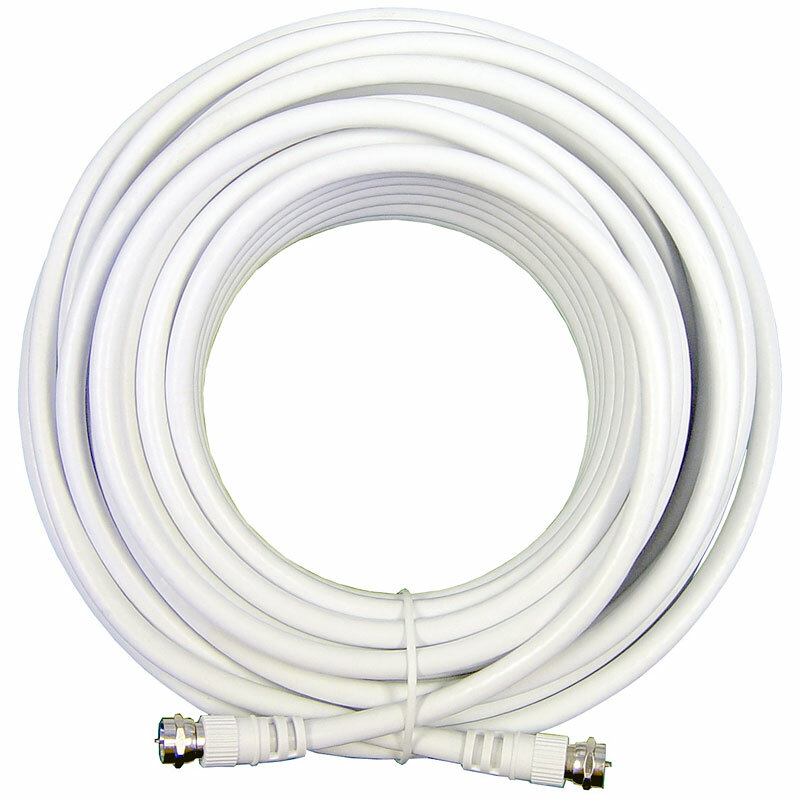 RG6 coax cable is used with 75-ohm cell signal boosters, including the weBoost Connect 4G for small homes and the weBoost Home single-room booster system. 240 coax cable is similar in thickness to RG6 (it’s ³⁄₁₆ inch in diameter), but with slightly less signal loss. 240 coax works with 50-ohm cell signal boosters. Like RG6, it’s best used in runs no longer than 30 feet. 240 coax cable is used in Top Signal’s HiBoost Home 4K and Home 10K systems for small- to average-sized homes. 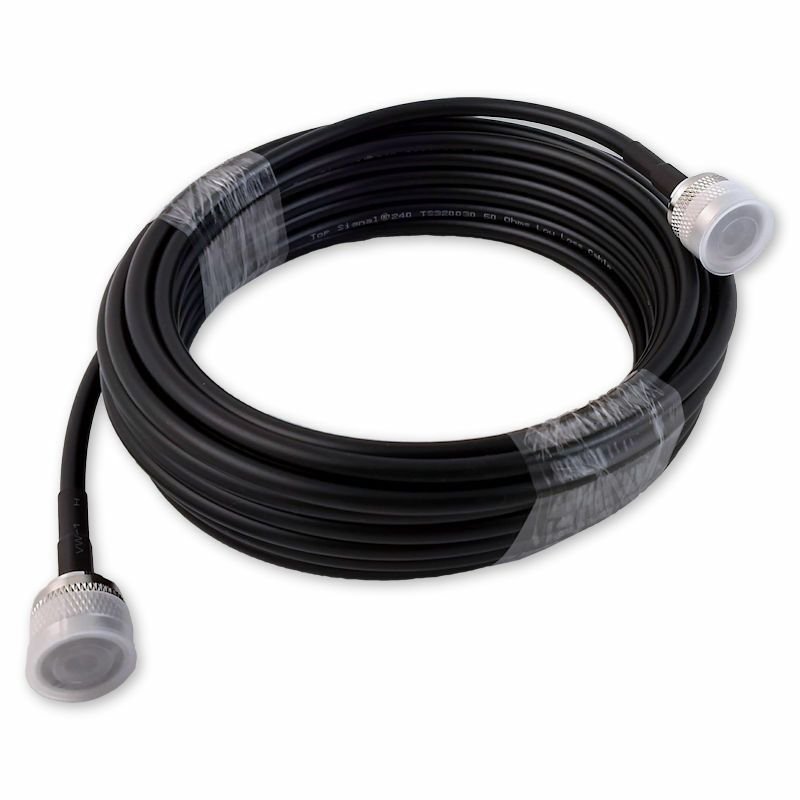 400 coax cable is very robust and has about half the signal loss per foot of RG6 and 240. 400 coax is used in commercial installations that require longer coax cable runs and lower signal loss ratios. 400 coax is larger than RG6 and 240 coax (just over &frac38; inch in diameter) and much more rigid, which makes it more difficult to conceal or run around tight corners; however, its performance results are much better than thinner cables. 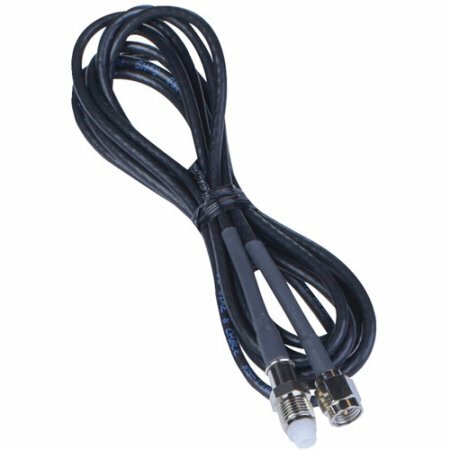 400‑series coax cable is used in weBoost Connect 4G‑X and HiBoost Home 15K home systems, and in most commercial systems, including the WilsonPro 70, WilsonPro 70 Plus, WilsonPro 1000 series, WilsonPro 4000 series, HiBoost SLT, and HiBoost Commercial 30K Pro. There is no signal in your area. A cell phone booster cannot amplify something that does not exist (just as you can’t multiply by zero). The cellular amplifier is too weak. If you expect to fill your 2,500-square-foot home with a usable cell signal, then you need to purchase a cell signal booster that has the right level of performance. Make sure your expectations match the system you are purchasing. The amplifier boosts the wrong frequencies. Make sure the booster you purchase amplifies the frequencies your carrier uses. For example, Sprint’s LTE Plus service—previously called Spark—operates in the 2500 MHz spectrum, which no cell booster on market will amplify. Older and less-expensive 3G boosters also don’t handle the newer, faster 4G LTE frequencies (see below). 4G, also known as five-band, which is newer and more expensive. 3G, also known as dual-band, which is older and less expensive. In our opinion, you shouldn’t buy a 3G cell signal booster. The major cellular carriers no longer sell 3G smartphones, and they are in the process of converting their 3G cell towers to 4G. By 2020, 3G service may not be available at all. If you use a 4G smartphone, a 3G cell signal booster won’t improve your reception; your phone is using frequencies that your booster doesn’t amplify. If you use a 3G phone, though, a 4G amplifier will amplify its frequencies. …or click here to contact us online. 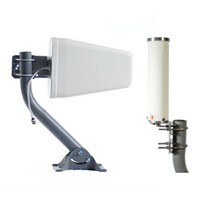 We can help you find the right cell phone signal booster system for your house, condo, apartment, or other residence.